Our readers' voices have been heard, votes have been tallied and the results are in! 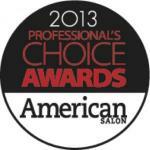 It’s that time of the year when we reveal the 2013 American Salon Professional’s Choice Awards winners. With a wide spectrum of categories to choose from, the beauty experts voted on the products, tools and skincare that they cannot do without.